For other uses, see Downtown (disambiguation). Downtown Chicago, the third most populous downtown in the U.S. Downtown Hagerstown, Maryland. This scale and style is typical of small and mid-sized cities in the United States and Canada. 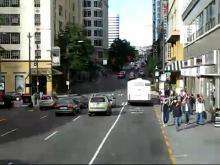 Timelapse video of Downtown Seattle from atop a Community Transit double-decker bus. Downtown is a term primarily used in North America by English speakers to refer to a city's core (or center) or central business district (CBD), often in a geographical, commercial, or communal sense. The term is not generally used in British English, whose speakers instead use the term City Centre or town. The term is thought to have been coined in New York City, where it was in use by the 1830s to refer to the original town at the southern tip of the island of Manhattan. As the town of New York grew into a city, the only direction it could grow on the island was toward the north, proceeding upriver from the original settlement (the "up" and "down" terminology in turn came from the customary map design in which up was north and down was south). Thus, anything north of the original town became known as "uptown" (Upper Manhattan), while the original town (which was also New York's only major center of business at the time) became known as "downtown" (Lower Manhattan). During the late 19th century, the term was gradually adopted by cities across the United States and Canada to refer to the historical core of the city (which was most often the same as the commercial heart of the city). Notably, it was not included in dictionaries as late as the 1880s. But by the early 1900s, downtown was clearly established as the proper term in American English for a city's central business district. Between 2000 and 2010, the downtown areas grew rapidly in population. In metro areas in the US with at least 5 million people, the population within 2 miles of the city hall grew twice as fast as the overall population in the metro area. Crime decreased much more in the city than in suburbs between 1990 and 2008 and in outer suburbs crime increased. The terms downtown and uptown can refer to cardinal directions, for example, in Manhattan, where downtown is also a relative geographical term. Anything south of where the speaker is currently standing, in most places, is said to be downtown. Anything north of the speaker is uptown. In the common New York City phrase "We're going to take the subway downtown", downtown refers to traveling in the geographic direction of south. A person standing on 121st Street and walking ten blocks south could also be said to have walked ten blocks downtown. The term uptown is used to refer to the cardinal direction north. Such concepts derive from Manhattan's elongated shape, running roughly north/south and nowhere more than 2 mi (3.2 km) wide. As such, transportation on the island travels in the uptown/downtown directions. The other boroughs are wider, and "downtown" there refers to Lower Manhattan, Downtown Brooklyn, or some more local business district. Mercantile efforts to promote the South Bronx as "Downtown Bronx" have met with little success. 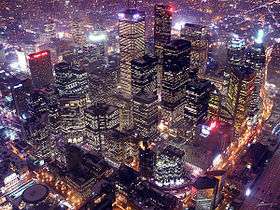 In some North American cities, downtown is the formal name of the neighborhood in which the city's central business district is located. Most major North American cities are located on major bodies of water, like oceans, lakes, and rivers. As cities expanded, people built further away from the water and their historical cores, often uphill. 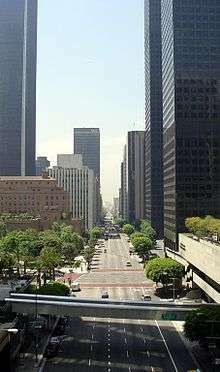 Thus the central business district of a North American city, or the historical core of the city, is often located "down", in altitude, relative to the remainder of the city. Many cities use the Manhattan model and continue to use downtown, midtown, and uptown both as informal relative geographical terms and as formal names for distinct districts. However, the city of Philadelphia uses the designation Center City, not downtown, due to the business district's central location, as well as Philadelphia's age and circumstances; "Center City" corresponds to the City of Philadelphia prior to its amalgamation with Philadelphia County in 1854, leaving it without a unique name, unlike the former boroughs surrounding it; the center of the city is also where Philadelphia City Hall is located within the city's original plat. New Orleans uses the term Central Business District (or CBD) for their downtown due to the historical French Quarter district taking up what would usually be considered the city's historical downtown district, and another area of the city south of the CBD holding the Downtown definition. New Orleans Central Business District — Historically, the term "downtown" referred to a different part of the city, and excluded the Central Business District. This usage has faded in recent decades. ↑ "Marketbeat United States CBD Office Report 2Q11" (PDF). Cushman & Wakefield, Inc. Retrieved May 18, 2013. 1 2 3 Robert M. Fogelson, Downtown: Its Rise and Fall, 1880-1950 (New Haven: Yale University Press, 2003), 10. ↑ Larry Ford, America's New Downtowns: Revitalization or Reinvention? (Baltimore: Johns Hopkins University Press, 2003), 242-243. ↑ Bernard J. Frieden & Lynne B. Sagalyn, Downtown, Inc. (Cambridge: MIT Press, 1989), 287-290. ↑ John F. McDonald & Daniel P. McMillen, Urban Economics and Real Estate: Theory and Policy (Malden, MA: Blackwell Publishing, 2007), 160. Look up downtown in Wiktionary, the free dictionary.